The G.I. Joe Collectibles Snake Eyes and Timber Sixth Scale Figure Set is now available for pre-order from Sideshow Collectibles! G.I. Joe is an elite military fighting force that battles the most dangerous terrorists organizations of the world, namely the group Cobra, and Snake Eyes is arguably the most popular member of the G.I. Joe team. Snake Eyes made his first comic book appearance in G.I. Joe, A Real American Hero #1 (1982), and acquired his companion Timber in issue #27. Together, they have been a powerful team against the numerous Cobra threats they have faced. This awesome set includes Snake Eyes and Timber. Snake Eyes comes with a full set of weapons — Uzi, XCR PDW Rifle, MP-SMG, grenade launcher and multiple grenades, pistol and holster, Daito sword and scabbard. He also comes with an assortment of switch out hands and two different portraits (heads) — one with goggles and one with visor. He has 16 points of articulation and stands 12″ high. Timber has 12 points of articulation and stands 6.5″ high. The set is brought to us by the creative team at Sideshow – Trevor Grove (Sculpt), Tim Niver (Sculpt), Idol Workshop (Sculpt), David Whitford (Paint), Nathan Eakins (Paint), Kevin Ellis (Costume Fabrication) and Seth Rinaldi (Design). An exclusive version of the set is available, which includes an aggressive Timber portrait. Roll over to Sideshow Collectibles to pre-order the G.I. 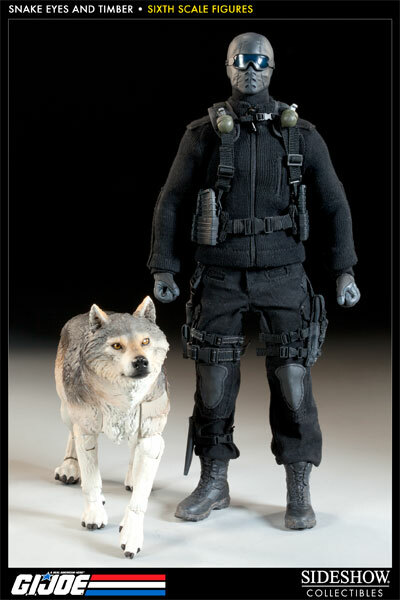 Joe Collectibles Snake Eyes and Timber Sixth Scale Figure Set today!